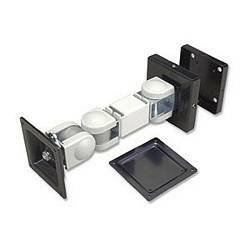 Our pivoting mount attaches your LCD monitor (with standard 75/100mm VESA mounting) securely to most any wall. Constructed of heavy-duty steel with sturdy nylon pivot washers, it holds your monitor right where you want it with no shake or unwanted motion. Great for kiosks and multiple monitor arrangements. Includes mounting hardware and 100mm VESA adapter.